Dal-għodu għan-nom ta’ Alternattiva Demokratika għamilt żjara ta’ kortesija lill-Ispeaker fl-uffiċini tiegħu fil-Parlament. Tkellimna dwar il-ħidma tal-Parlament. Jiena għażilt li niffoka fuq żewġ punti. L-ewwel dwar in-nuqqas tad-dħul fis-seħħ tal-liġi dwar l-Istandards fil-Ħajja Pubblika u wara dwar ir-apport annwali tal-Ombudsman għall-2017. Żewġ argumenti li huma relatati ħafna. Bid-dewmien tad-dħul fis-seħħ tal-Att dwar l-Istandards fil-Ħajja Pubblika il-Parlament qed jagħti messaġġ wieħed ċar: li m’għandux għaġġla biex il-Membri Parlamentari jagħtu kont ta’ egħmilhom kull meta dan ikun meħtieġ. Jidher li għad ma hemmx qbil bejn Gvern u Oppożizzjoni dwar il-ħatra tal-Kummissarju għall-Istandards fil-Ħajja Pubblika, liema Kummissarju jeħtieġlu li jinħatar bi qbil ta’ żewġ terzi tal-Kamra. Jidher li l-partiti rappreżentati fil-Parlament m’għandhomx għaġġla biex din il-liġi tkun implimentata. L-ewwel damet tlett snin għaddejja mill-Parlament (Mejju 2014 sa Marzu 2017). Issa ilha ħmistax-il xahar li rċieviet l-approvazzjoni tal-President tar-Repubblika, iżda għada fuq l-ixkaffa. Dan kollu jassumi sinifikat ikbar jekk wieħed jarrah fil-kuntest tar-rapport tal-Ombudsman għall-2017 fejn hu ċar li d-dritt għall-informazzjoni dwar l-amministrazzjoni pubblika qiegħed taħt assedju. Hu ċar li l-kontabilitá u l-aċċess għall-informazzjoni jimxu id f’id fi stat demokratiku. Huma l-pedamenti tad-demokrazija li l-Parlament għandu l-obbligu li jindokra. Tlabt lill-Ispeaker biex jiġbed l-attenzjoni tal-Parlament li mhux aċċettabbli li nibqgħu bit-tkaxkir tas-saqajn. Hu neċessarju li l-Parlament jassigura l-ħarsien tad-dritt tal-aċċess għall-informazzjoni kif ukoll li l-kontabilitá ma tibqax slogan. Around three weeks ago Alternattiva Demokratika – The Green Party in Malta – requested the Electoral Commission to initiate an investigation into the illicit use of public property by the Labour Party. The case revolved around the use of the Prime Minister’s official residence at Girgenti as a meeting place for the Labour Party’s Parliamentary Group. Various members of Cabinet tweeted photos of this Parliamentary Group meeting. It is not so far known whether the Electoral Commission will be taking any action on the Girgenti matter other than that it was on the agenda for a Commission meeting. Now another, more serious issue, has cropped up out of the blue. This is due to the very serious claim made by Silvio Debono that he gave a political donation to the Nationalist Party in the amount of about €70,800 which was camouflaged as a payment for services rendered through the production and use of a fake invoice for the purpose. This payment is alleged to have been made in a concealed or disguised manner being intended for the political party but by way of deception it was channelled through the party’s commercial arm. The Nationalist Party, on the other hand, counter-claimed that a payment for €70,800 was made but that this was as payment for services “actually” rendered by its commercial arm, Media Link Communications, to two of the companies forming part of DB group, Silvio Debono’s group of companies. However, at one point the Nationalist Party also declared that it will reimburse the “tainted money” because it will not be compromised. The Nationalist Party has to chose between its contradictory reactions: is the €70,800 received from Silvio Debono tainted or is it a payment for services? Silvio Debono claims that he has the fake invoices and the receipts for the amount paid through which he can substantiate his claims. He further stated that no services were rendered to his companies by Media Link Communications. This allegation strikes a direct hit at transparency and accountability, the very foundation of the legislation regulating political party financing. 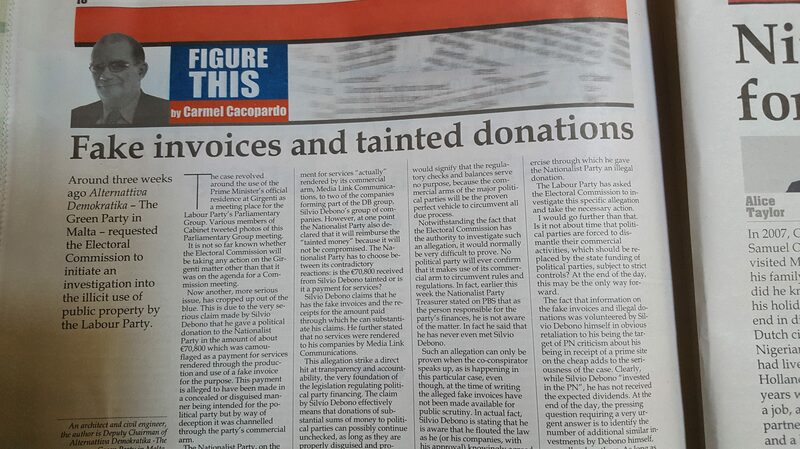 The claim by Silvio Debono effectively means that donations of substantial sums of money to political parties can possibly continue unchecked, as long as they are properly disguised and provided that those with a finger in the pie keep their mouth shut. If this allegation is proven, it would signify that the regulatory checks and balances serve no purpose, because the commercial arms of the major political parties will be the proven perfect vehicle to circumvent all due process. Notwithstanding the fact that the Electoral Commission has the authority to investigate such an allegation, it would normally be very difficult to prove. No political party will ever confirm that it makes use of its commercial arm to circumvent rules and regulations. In fact, earlier this week the Nationalist Party Treasurer stated on PBS that as the person responsible for the party’s finances, he is not aware of the matter. In fact he said that he has never even met Silvio Debono. Such an allegation can only be proven when the co-conspirator speaks up, as is happening in this particular case, even though, at the time of writing the alleged fake invoices have not been made available for public scrutiny. In actual fact, Silvio Debono is stating that he is aware that he flouted the law as he (or his companies, with his approval) knowingly accepted to settle fake invoices. In so doing, Debono is claiming that he knowingly carried out an exercise through which he gave the Nationalist Party an illegal donation. The Labour Party has asked the Electoral Commission to investigate this specific allegation and take the necessary action. I would go further than that. Is it not about time that political parties are forced to dismantle their commercial activities, which should be the state funding of political parties, subject to strict controls. At the end of the day, this may be the only way forward. The fact that information on the fake invoices and illegal donations was volunteered by Silvio Debono himself in obvious retaliation to his being the target of PN criticism about his being in receipt of a prime site on the cheap adds to the seriousness of the case. Clearly, while Silvio Debono “invested in the PN”, he has not received the expected dividends. At the end of the day, the pressing question requiring a very urgent answer is to identify the number of additional similar investments by Debono himself, as well as by others. As long as such investments yield suitable dividends, we may possibly never know the answer.